Short Pours are bits of news that we at QCD think are worth your while. Follow the attributed links for the whole story! In the Ratebeer.com Best for 2013, Dilly Cafe won best restaurant and Jungle Jim’s (Fairfield) won best grocery store for the state of Ohio. 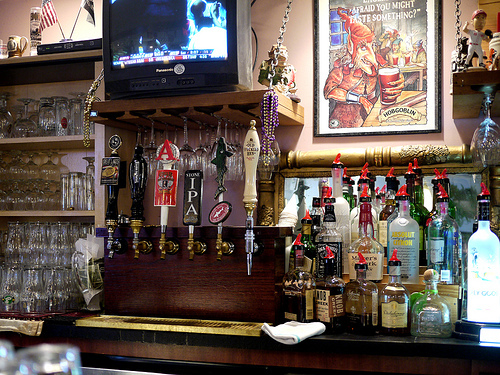 Jackie O’s, notably, won best brewpub in Ohio. There are many frustrating experiences in life. Like paying $33 for a bottle of wine at a restaurant that you know retails for about $10. Or finding a beer you love and being unable to find it for sale. Or being unsure where to take a date for a good meal that’s not too expensive. Luckily the Dilly Cafe in Mariemont can help you with all of these things. Part casual but classy restaurant, part wine and beer store, and part bar, The Dilly Cafe manages to wear all of these hats without sacrificing any of them. I know avid beer lovers who make the trip to Mariemont just to find a favorite beer that is unavailable elsewhere and I’ve taken my wine-loving mom here for dinner and a bottle. The ambiance is great for a date. There is usually an acoustic musician of some kind playing but it never gets in the way of conversation. It seems like it could be difficult to combine a retail shop with a quality dining experience and I can think of other places that have attempted such a feat and failed. The Dilly Cafe does have really well-done American food, including incredible burgers and a decent selection of vegetarian options in addition to more formal dinner offerings. It also has an incredible beer selection that is available for sale right at the back, behind where the tables are all arranged. But the corridor that is created by the way the tables, hostess station and bar are arranged means that you don’t ever have casual customers squeezing past you while you enjoy your meal. The thing that really makes the Dilly Cafe stand out as a restaurant is the attached wine store. There is a nice selection of wine available by the glass or bottle on the menu but for an even wider selection and better price, you can purchase a bottle at the wine store and for a $5 corking fee you can enjoy it with dinner. Better yet, on Mondays and Tuesdays there is no corking fee at all, making this the only restaurant I know of that can offer the holy grail: retail priced wine with dinner. Or lunch for that matter. Every time I have been the staff is friendly, the food is good, and the atmosphere is relaxed and inviting. So if you are a beer snob, a wine lover, or just someone who likes good food at a decent price I recommend you give this place a try. Thanks to the wonderful Cincinnati photographer and blogger 5chw4r7z for use of his pictures. He is a big fan of the Dilly Cafe as well apparently.